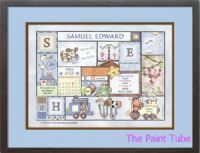 This baby history framed wall art is a great keepsake to remember all the important statistics about a new born. Name,date of birth, weight,inches,first home address,delivering doctor, siblings, pets are all a part of this keepsake. It measures approximately 16" x 20"